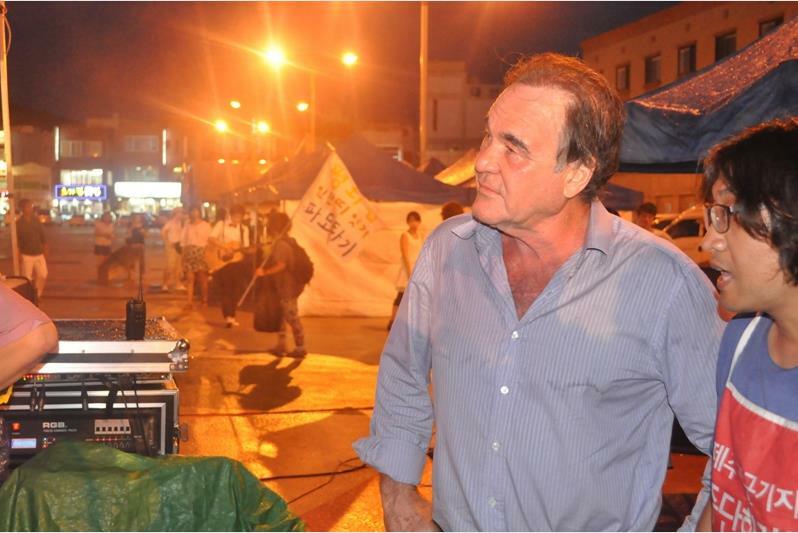 In the heat of a scorching Jeju summer, Oliver Stone was at times unaware of his target last week. The 36-degree heat had made its mark on his denim shirt, as it had on the marchers who were listening to his speech with earnest. 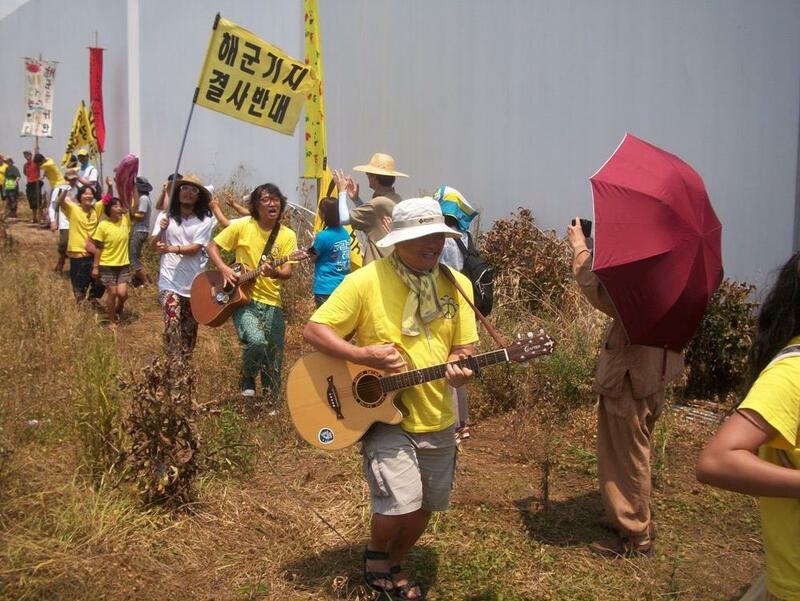 They were still hoping that Stone's visit could reverse the seemingly inevitable naval base construction in the southwest of Jeju Island, South Korea. Stone had arrived to warn locals of the “war, pollution and crime” that would befall them if the naval base at Gangjeong were built. Worse, the island’s famed water would be undrinkable: “Your water will be contaminated...you will no longer be drinking out of a tap," he warned. The anti-naval base movement had had celebrity support in the past, but none had yet set foot on Jeju to offer support. Noam Chomsky lent his voice to the campaign but stopped short of boarding a plane. This meant Stone’s visit - particularly at such a late stage - came as a bolt out of the blue. As Stone left the seafront stage, he appeared bedraggled and tired, particularly after a long march and demanding schedule. As the lights teased sweat from his brow, expecting to be rebuffed, I requested an interview. The response surprised me. As we walked toward an empty tent we were followed by local and national press. Campaigners rushed in for profile shots and Stone smilingly obliged. 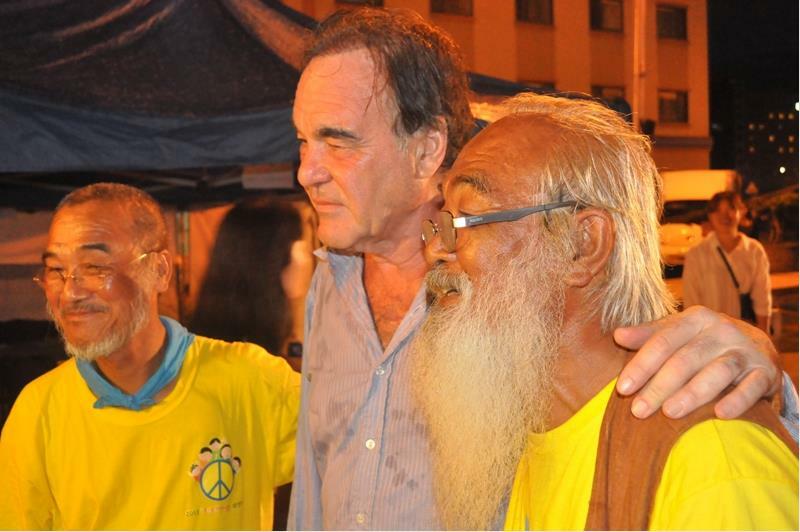 Then followed the campaigners, brothers and Fathers Mun, the real celebrities of the Gangjeong Movement; they all embraced. “We’ll have a chat once this is finished,” Stone reassured me, genuinely. The news that Stone was to visit Jeju had arrived a few weeks previously from a contact within the Gangjeong international team. 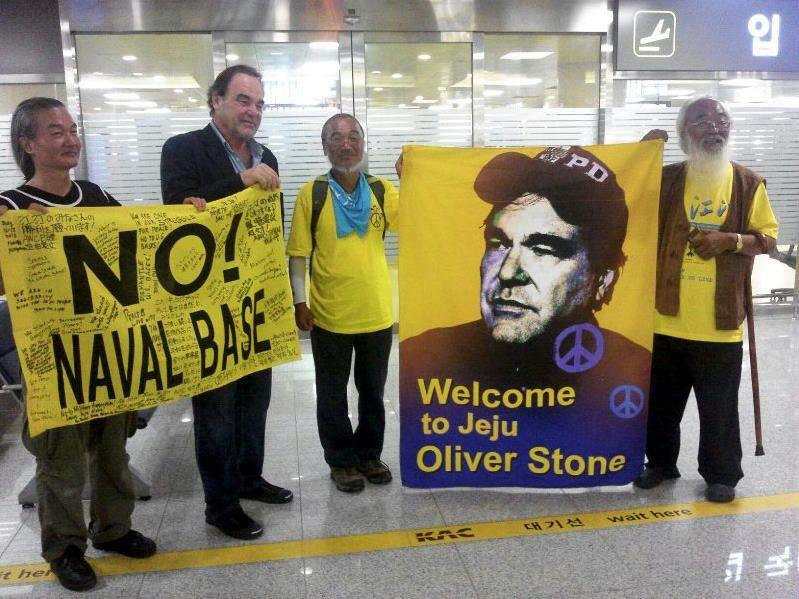 I had not expected it to come to fruition, but a few days later an email arrived: “This is Oliver Stone’s Jeju schedule,” it read, with a detailed itinerary. He was actually coming, it seemed. 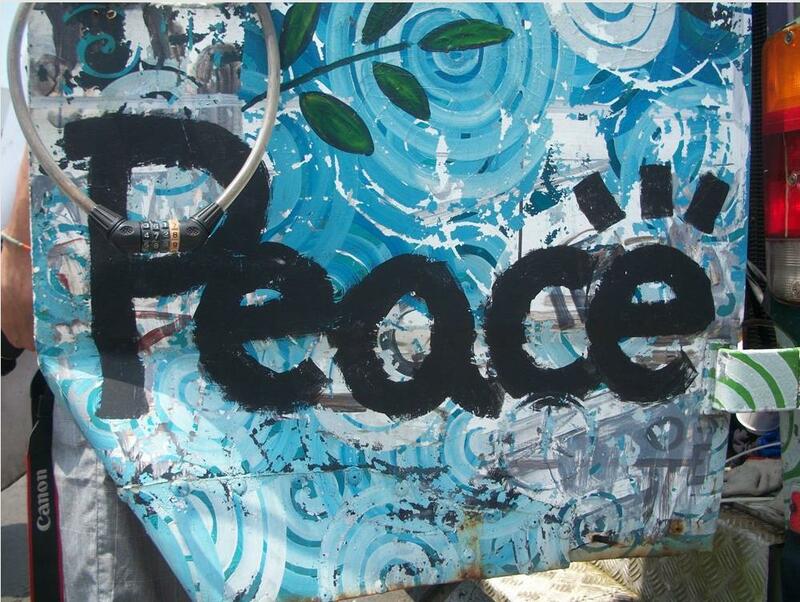 The anti-naval base movement fitted snugly into this thesis and Stone was loath to see history repeating itself. He was seeking to clear “the fog” that was allowing the South Korean government to build a provocative naval base on China’s doorstep, to increase US reach in the region. As we settle down in the tent, local news reporters poke camera lenses at us through the dark. I ask if the base was founded on fear: Does China not pose a threat to the United States? “The threat has been manufactured,” says Stone. “[The Chinese] spend just 10 percent of what the US spends on their military. The threat is being built up across the region,” he says, reiterating what he had stated in his speech. This talk of threats and US militarization sounded very familiar; it mirrored the themes of his documentary. It used to be the Soviets, but East Asia had - yet again - become the center. A rising China was encroaching on US hegemony and the hegemon was reacting as “a wounded empire...with great psychological weakness,” says Stone. The Jeju base is part of this reaction. Obama’s “Asia Pivot” strategy, according to Patrick M. Cronin of Global Asia, seeks to “rebalance” the shift in “economic gravity” to the Asia-Pacific region. It was announced back in Nov. 2011 and detailed by defense chiefs in Jan. 2012. While some US sympathizers cite this as essential to deal with growing regional uncertainty and aggressive Chinese territorial claims in the East and South China Seas, for Stone the US is “infesting the area” with an “informal blockade” from Japan and Korea to Malaysia, Singapore, and down to Australia. “There have been some profound mistakes, but we still have a chance, I strongly believe, to correct them,” says Stone. Within this narrative, the base at Gangjeong is more than a military installation, it is the edification of fear to justify US military budgets and control of the seaways. It goes beyond symbolism, however. Stone spells out the reality in his speech. “It will be the most forward navy base in the world, much more elaborate, much more sophisticated than the bases we have in Okinawa. There will be Aegis destroyers, anti-missile defences, cyber warfare, drones, and Patriot Missiles, too. This is serious, serious warfare,” he warns. The Jeju people are acutely attuned to the corollary of such fear; Stone, too, is well versed in the worst human rights abuse in South Korean history: 4.3, or the Jeju Massacre. “Now what did these villagers do? They were basically trying to fend for themselves [and] farm...and set up...people’s committees and peasant communes...but [they were] wiped out in cold blood with US approval,” he says. “These ghosts...are now still there,” he adds. From the slaughter of Communist Greeks by the British after World War II, to the murder of Vietnamese villagers by US forces in the 1960s, the ghosts of the Jeju Massacre fit into the discourse of fear of the “Red Other” that Stone’s work exposes in the post-1945 new world order. Back in the current, yet still seeing things through a broad historical lens, Stone will not be fooled by the Chinese threat. History teaches him that the rhetoric of division often veils the hegemon’s true intentions. He spells it out. Supporters point to Stone’s worthy humanitarian ideals in seeking to avert conflict, yet others criticize the unwarranted interference of a Hollywood star in a Korean dispute. The Jeju Islanders had the chance, critics say, to make their voice heard loud and clear in the December 2012 elections, but base-proponent and current president Park Geun-hye was victorious, nationally and locally. I suggest to Stone that this is the movement’s Achilles’ heel in terms of a public mandate: Two of Gangjeong’s five wards - Daecheondong Je-2-tu and Je-3-tu - even voted for Korea’s first female president, with only 211 votes between the candidates across the whole of Daecheon-dong, according to government statistics. The lack of a democratic deficit problematizes the exploited-villagers thesis. But for Stone this is actually an indication of the shortcomings of a two-party system that pits citizen against citizen through manufactured division. “I don’t know much about the political situation in Korea, but it is definitely a bipartisan issue,” he says. The base debate is certainly split along party lines and in the crowds around our tent fly trade union flags as might be expected at any workers’ strike. Stone feels it is a natural reaction to the right-wing lurch regionally. “There is no dictatorship in South Korea now, but you have a president now who’s father was a dictator...You have increasing tension across the region and government moving towards the right in both Korea and Japan,” he says. Avoiding the minutiae of local politics, Stone touches on this increasing regional tension in his speech. “We are in a very difficult situation. A situation now, that is throughout the Pacific. It is easy now to get in a war. Korea is on the frontline. Jeju is 500 k.m. from Shanghai. You are on the frontline. I am very scared about that situation,” he says. This threat has very little stature back in Stone’s backyard and the base is an almost unknown. I ask if addressing this was one reason for the visit: Would he be taking the fight back home? With this moment of realism the noise from the stage increases and the conversation is drowned out. 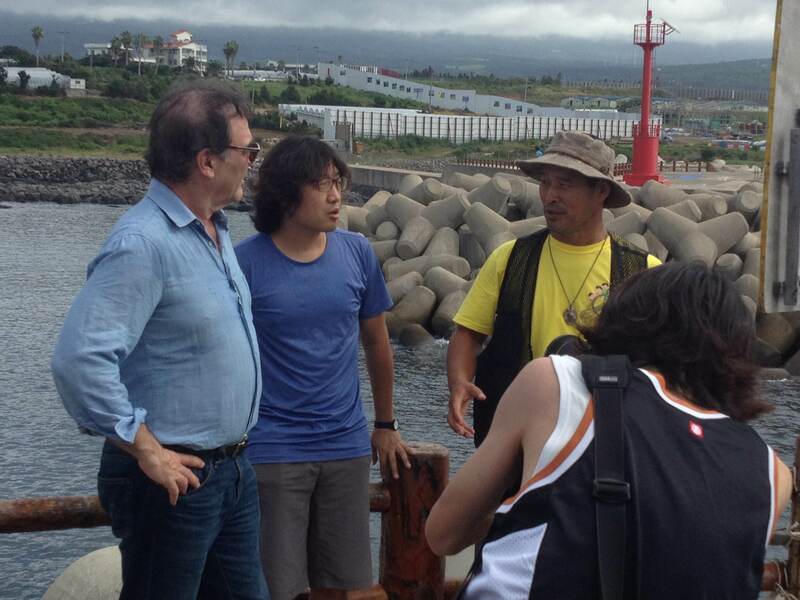 Stone promised on stage to “make documentaries about Jeju,” and I ask finally if anything is in the pipeline.